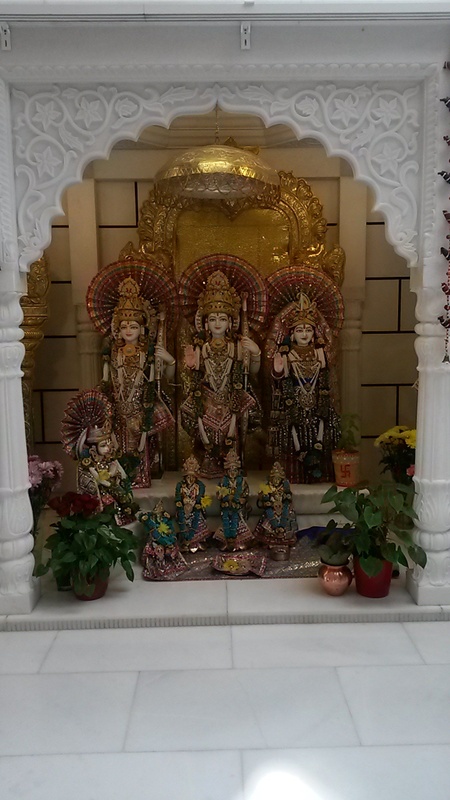 On 25.9.14 we had the pleasure to visit two key places of worship in Bradford, the Shree Lakshmi Mandir and Guru Gobind Singh Gurdwara. From this trip we hoped to improve our understanding of these two religions; from an insider point of view and appreciate the methods of worship and practice within these traditions. This was a great opportunity for everyone to deepen their subject knowledge, in preparation for our new roles in school. We arrived at the temple eager to experience Hindu worship first hand, we were politely asked to partake in the cleansing rituals that everyone (even the Queen!) would complete before entering a Hindu temple. After completing the absolution process; of removing our shoes and washing our hands, we were taken into the main room of worship. 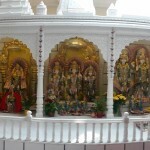 The main temple really was a beautiful sight, a long row of colourful deities surround by a pristine white structure in the style of a mandir. Our host Seema explained her work in the community, highlighting the importance of how to educate young learners about Hinduism without causing confusion. 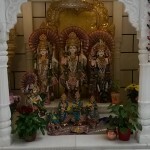 After explanations of the various beautiful deities within the temple, we had the option to ask our own questions and experience the temple further. 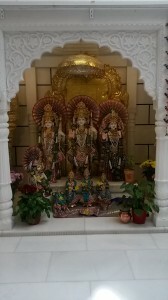 It was the first day of the festival of Diwali during our visit. This meant we got to experience families coming to place offering to the deities to mark the beginning of the festival. The next stop of the day was the Guru Gobind Singh Gurdwara, here we were greeted by Narrinder with refreshments and enjoyed these whilst learning about the langar room and the importance of this room in a Gurdwara. 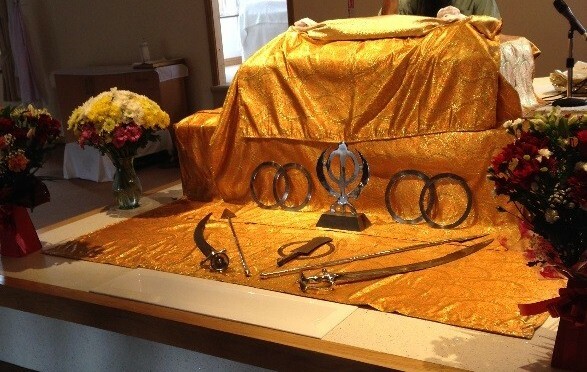 This is a key Sikh practice and anyone visiting a Gurdwara would be greeted by free food or drink upon entering the temple, the refreshments offered are donated by the community. This is because of the Sikh belief in helping everyone (Sewa). After our introductions and extra biscuits we were led upstairs to the main room of worship. Here, we sat and observed Narrinder recite the hymns around opening the sacred text and learnt about the process of laying the text to rest at dawn and waking the text from its bedroom, at the far corner of the room. 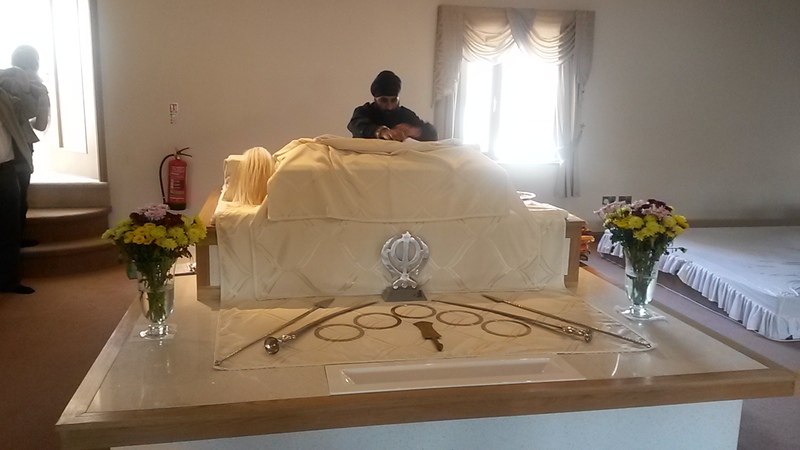 After asking questions about how they would carry out different types of ceremonies such as weddings and funerals we moved into a separate room and talk about Sikhism away from the Gurdwara. 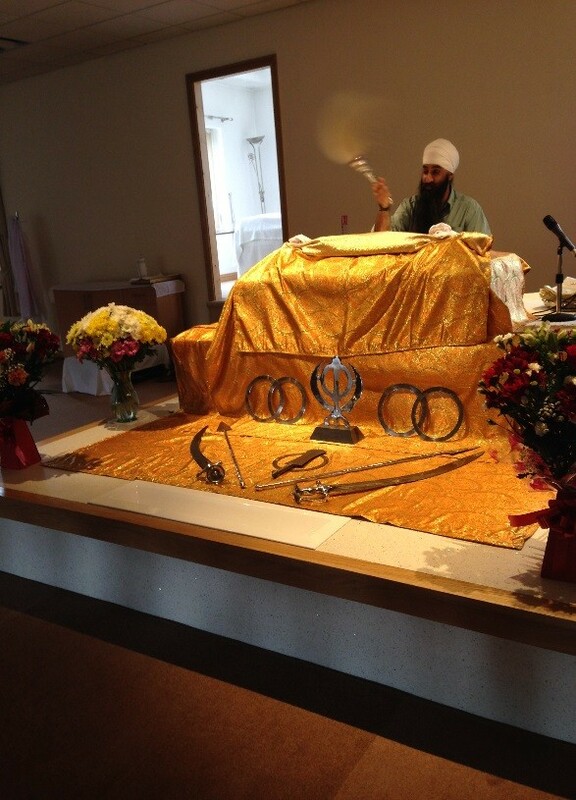 Narrinder gave us a talk through the 5 K’s of Sikhism, allowing for you to experience these objects first hand whilst learning about the spiritual meaning from an insider view. At the end of our visit Narrinder was kind enough to play the sitar for us ending our Sikh experience nicely with an opportunity to appreciate the music of the Sikh faith which is so central to their worship. After our lunch in a room of the Interfaith Centre in Bradford, we popped into Bombay Stores, UK’s largest Asian department store. Here we got to explore both ladies and gentlemen’s traditional dress, staring longingly at the large selection of jewelry and pick up some little bits and pieces that we could incorporate into our teaching. This was a great end to an enjoyable trip. Arguably the best way to learn about a religion is to experience it for yourself. 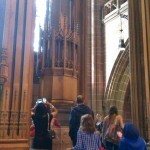 The secondary PGCE group were given the opportunity to visit Liverpool Cathedral on the 11th September 2014. We were not only given a tour of the wonderful gothic style building, but we were also told about the various outreach activities which the church is involved in, or their ‘faith in action’. It is impossible not to feel overwhelmed by the vastness of the building when you arrive at Liverpool Cathedral. The Cathedral sits on a hill, towering over Liverpool at an incredible 101m. It is the biggest Cathedral in the UK, the fifth largest in the World, and standing by the entrance nearest Hope Street, you really do get a sense of why for so many religious people a building like this truly gives them a sense of the awesomeness of God and the smallness of humanity. When you walk through the entrance, you arrive into the very aptly named ‘Great Space’. The simplicity of the building adds to the vastness, and I think it’s fair to say that the whole group couldn’t help but gasp in amazement at the huge space we had entered. Here we met our guide, a lovely lady who works for and is dedicated to the mission of the Cathedral in Liverpool. First we were given a brief introduction to the building and learnt some new facts. The Cathedral was designed by architect Giles Gilbert Scott in 1904. 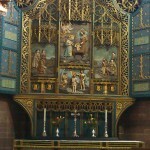 Until 1880, Liverpool had been under the Diocese of Cheshire, and with the creation of the Diocese of Liverpool, a new Cathedral had to be built. Upon reflection, it seems that the time and context in which the Cathedral was built has had a great impact upon its design and ethos. It was very much built by the people of Liverpool, for the people of Liverpool, and a great example of this is the fact that the Bee Gees played there in 1965! 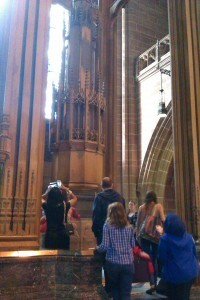 Our guide also pointed out that Liverpool is a city of two Cathedrals. Liverpool Cathedral, which is Church of England and Liverpool Metropolitan Cathedral, which is Roman Catholic. The two are linked by the aptly named ‘Hope Street’, highlighting the plurality and the ecumenical nature of the religious scene in Liverpool today. After this we were shown the key features of the building. We were shown the World’s highest and widest gothic arches, the entrance to the tower, the font, the organ, the beautiful stained glass windows, the altarpiece, and the stunningly intimate Lady Chapel. 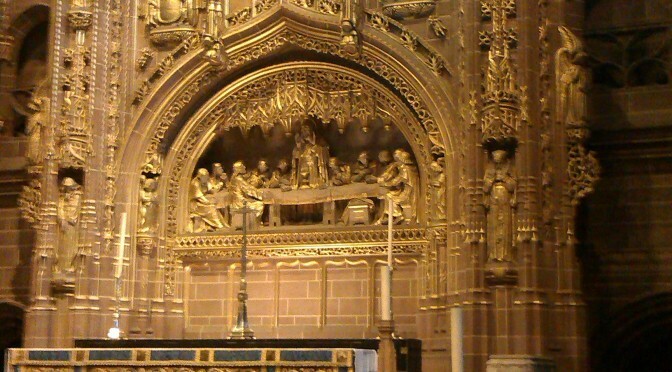 Each of these are key features of any Cathedral, and it was interesting to that in one sense the Cathedral is very typical, yet in another it is very particular to Liverpool. For example, the Great West Window at first glance is a beautiful, but no means unique, stained glass window. Pictured in the glass are important Biblical stories, representations of the apostles, and of course a representation of the Christ at the top of the window. However, upon closer inspection, at the foot of the window is an image of the Liverpool skyline. The city is encapsulated within the sacred, and you really do sense that the city is as much a part of the Cathedral as the Cathedral is a part of the city. Underneath the Great West Window is the thought provoking Tracey Emin sculpture. In pink neon in the artist’s handwriting it says “I felt you and I knew you loved me”. It is impossible not to notice, and stands out against the relative simplicity of the rest of the building. We were told that the piece of art is somewhat controversial; some people love it, and others think that the church is simply better off without it. Next, we saw the font, where infants are ‘baptised’ into the church community. Our guide pointed out that the font is a very similar shape to the Cathedral tower. Whether this was purposeful or not, she did not know. Around the bottom of the font are images of the twelve Apostles complete with their traditional symbols; Peter with the keys to the kingdom, Andrew with the Fish and St. Andrews cross, and each of the Apostles respectively. Aimee noticed that the foot of one apostle was standing on a head. Our guide could not offer an explanation as to why this was, or which apostle it represented, so if anybody knows please do tell us! We were then shown the Cathedral’s organ – the largest pipe organ in Europe. We were shown the altar piece which shows the passion of Christ and his resurrection, and were also shown the Cathedra, the Bishops seat, which every Cathedral must have to be a Cathedral. This was something I did not know before visiting the church; our PGCE days out certainly are useful in broadening our subject knowledge! On the way out I was able to take some of the leaflets for events and services in the Cathedral. It is very clearly a vibrant and forward thinking place which is not as some would imagine a cathedral to be. The word ‘cathedral’ often conjures up images of dark, dreary buildings, old men in robes and solemn worshippers. 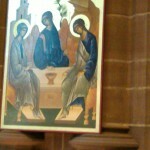 The reality in Liverpool Cathedral is very different. On offer are various children’s groups, Cafe Church, an Alpha course for those wanting to explore the claims of Christ for themselves, as well as traditional worship services. There is a living dialogue, not only with other Christian traditions in Liverpool, but also with other faiths. All in all it was a second to none experience. No doubt each of us will visit the Cathedral again and make use of all it has to offer throughout the course of this year.